Recruitment poster for the Polish Army in France by the graphic artist, W. Benda. Image used with permission of the Polish Museum of America, Jan Lorys, Curator. 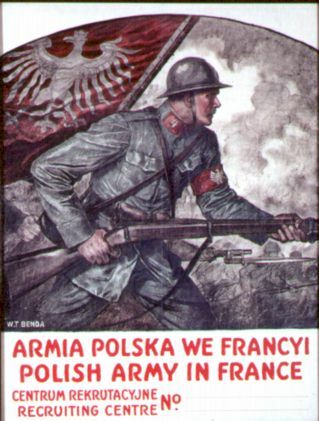 An estimated 20,000 Polish persons answered the call to fight for freedom and the opportunity to regain Poland’s independence during World War I in the Polish Army in France (in Polish, Armia Polska we Francyi). They were recruited from among the Polish immigrants who came to America to fight with France. The Polish Army in France was also called “Haller’s Army,” after the general who commanded it, or the “Blue Army,” for the blue uniforms the soldiers wore. Polish Genealogical Society Newsletter, Vol. X, #1, Spring 1987, pages 1, 3-4. Searchers, the Newsletter of the PGS of Western New York, #8, January 1993, pp. 17-20. “Buffalonians in Polish Army,” compiled by Ted Smardz, a listing of Buffalo recruits. The city and state give the place the person was from when volunteering. This is helpful to narrow the choices if the person of interest has a common name. The last column is labeled “Form” but serves as a location code. It describes which record group the information will be found in. Group A is a collection of form A papers (described below). Group C is a collection of form C papers. Both of these collections are bound into volumes. To locate the record, the page number, volume, and record group must be provided. Group L is a collection of loose papers. They are duplicates of those in Group A and Group C. If you order Group L you do not have to order Group A and C.
The page column of the index tells you which forms you can expect to find among the loose papers. A single individual might appear in the index three times– having paperwork in each collection. Form A is an intention to volunteer and contains the name, address, age, and marital status. See an English translation of a blank Form A. Form C is the final commitment paper and the most genealogically significant for researchers. Form C includes date and place of birth and usually the name and address of a parent or other close relative. See an English translation of a blank Form C.
The forms are typically carbon paper copies of the original and in some cases do not provide a quality photocopy.